Age-related infertility is becoming more common. Several factors have contributed to this trend, one of which is that many women don’t realize that their fertility begins to decline in their late 20s or early 30s. In addition, stories in the media have lead some to believe that they can delay getting pregnant and then use in vitro fertilization (IVF) when they’re ready. However, age affects the success rates of fertility treatments as well as the natural ability to get pregnant. For example, a 30-year-old woman has about a 20% chance per month to get pregnant. By age 40, however, the chance is only about 5% per month. In many cases, these percentages are true for natural conception as well as conception using IVF. Fertility decreases with age, particularly after age 35. Even though women today are healthier and taking better care of themselves than ever before, improved health in later life does not offset the natural age-related decline in fertility. Adapted from Menken J et al. Age and infertility. Science. 1986;23:1389. As a woman ages, her fertility declines due to normal, age-related changes that occur in the ovaries. Women are born with all the eggs that they will ever have in the ovaries, unlike men who continue to produce sperm their entire lives. Even though women have one to two million eggs in the ovaries at birth, this number declines to about 400,000 by puberty. Of the eggs remaining at puberty, only about 300 – 400 will be ovulated during a woman’s lifetime; the rest will undergo atresia. Atresia is a degenerative process that occurs regardless of whether a woman is pregnant, has normal menstrual cycles, uses birth control, or is undergoing fertility treatments. Smoking appears to accelerate atresia and is linked to earlier menopause. Ovarian reserve refers to the fertility potential of the ovaries. It mainly depends on the number and quality of eggs in your ovaries, and how well the ovarian follicles respond to hormonal signals from your brain. As one ages, the reduced number of eggs in the ovaries cause a decrease ovarian response to hormones (FSH and LH) produced by the pituitary gland. As a result, the pituitary produces more of these hormones in an attempt to “jump start” egg development in the ovaries. When the ovaries stop responding to FSH and LH, menstrual cycles become shorter. Eventually the ovaries may not release an egg each month. Several tests are available to evaluate the ovarian reserve. High levels of FSH early in the menstrual cycle indicate that the ovarian reserve is low (diminished ovarian reserve), and the chance of conception is poor. Normal levels of FSH, however, may not necessarily indicate that there is a good chance of conception. A woman’s age is the most important predictor of her potential to become pregnant. Other tests of ovarian reserve include anti-mullerian hormone (AMH), the clomiphene citrate challenge test (CCCT), and ultrasound assessment of ovarian volume and antral follicles. Though not as abrupt or noticeable as menopause in women, changes in fertility and sexual functioning do occur in men as they grow older. Despite these changes, there is no maximum age at which a man cannot father a child, as evidenced by men in their 60s and 70s conceiving with younger partners. As men age, sperm morphology (shape) and motility (movement) tend to decline. In addition, there is a slightly higher risk of gene defects in their sperm. Medical illnesses may adversely affect a man’s sexual and reproductive function. Not all men experience significant changes in reproductive or sexual functioning as they age, especially men who maintain good health. As you age, the eggs in your ovaries also age and are more likely to have genetic abnormalities. For example, chromosomal disorders such as Down syndrome are more common in children born to older women. In addition, when eggs from older women are fertilized, the embryos are less likely to develop. For this reason, women who are over 40 are at increased risk for miscarriage. Modern infertility therapy allows women many options. However, these treatments may have significant financial, emotional, and social consequences. Some couples decide that the best option is not to undergo infertility treatment, but to consider alternatives such as adoption or remaining childless. If a cause for infertility is identified, a specific treatment may be recommended. However, sometimes no additional problems are identified, and a couple’s infertility is unexplained with the exception of age-related factors. With unexplained infertility, or when traditional treatments have failed, advanced fertility therapies such as ovulation induction with intrauterine insemination (IUI) or in vitro fertilization (IVF) may be suggested. In a cycle using ovulation induction and IUI, various fertility medications are used to initiate the development of multiple eggs. When the eggs are ready to ovulate, the male partner’s sperm is placed directly into the uterus. IVF involves a procedure to remove the eggs and fertilize them using the male partner’s sperm in the lab. The resulting embryos are then transferred to the uterus. Age affects the chance for pregnancy with all treatment types. In women over 40, the success rate of ovulation induction with IUI is generally less than 5% per cycle. This compares to success rates around 10% for women aged 35 to 40. 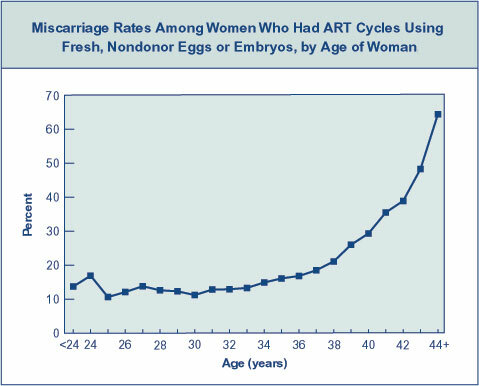 IVF is more effective, but also has relatively low success rates in women 40 and older, generally less than 15% per cycle. 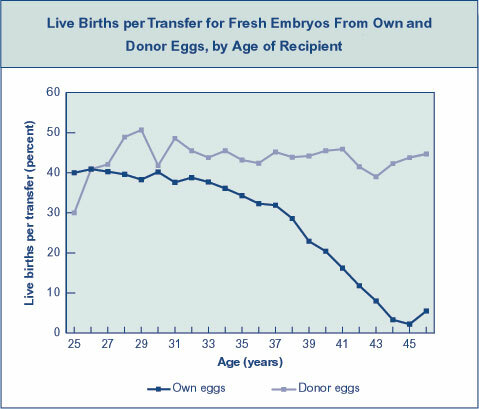 In an egg donation cycle, the donor receives fertility medications to stimulate the production of multiple eggs. At the same time, the recipient is given hormone therapy to prepare her uterus to receive the fertilized eggs (embryos). After the eggs are obtained from the donor, they are fertilized in the laboratory and transferred to the recipient’s uterus. Individuals may choose to use a known donor, such as a friend or relative, or an anonymous donor. Many patients choose a donor whose physical characteristics, social, or educational backgrounds are similar to their own. Counseling is recommended so that all parties understand the ethical, legal, psychological, and social issues involved.